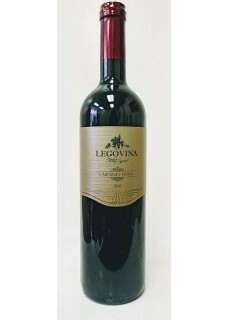 Legovina Cabernet Franc, is a ripe wine, which is covered with dark sweetness on the nose, while the palate is dominated by fruity tones of mature cherry. Looking into the depths of the body of this Cabernet Franc, we find black olives, skin and the earth covered with autumn leaves, which rounds off its complex taste composition. Medium body with balanced alcohols and freshness, this wine unmistakably meets a wide audience without losing complexity and character to give added value, which is an excellent value and price ratio! 'Cabernet Franc' belongs to the line of wine 'Matura' families Legovic, and represents a complex wine of great potential maturation. Characterized maturity exceptional balance of taste and aroma, pronounced varietal characteristics and structure refined recognizable Istrian terroir. Created a screen of superior grapes, using traditional cultivating. This wine has been matured for over 4 years in oak barrels. This is probably the best Cabernet Franc from Croatia! 'Legovina' is a small family winery owned by the family Legovic, located on the west side of the Istrian peninsula, in the village of Mekisi at Kaštelir, twelve kilometers from Porec. Vineyards, which is currently 11 hectares, planted on Istrian red soil at 150-230 meters above sea level. Family Legovic wine deals for generations, the century-old tradition, for the needs of their household. The prize for the effort of the whole family in which everyone truly committed to contribute to the development of the economy, as many honors and awards received at competitions and exhibitions of wine.